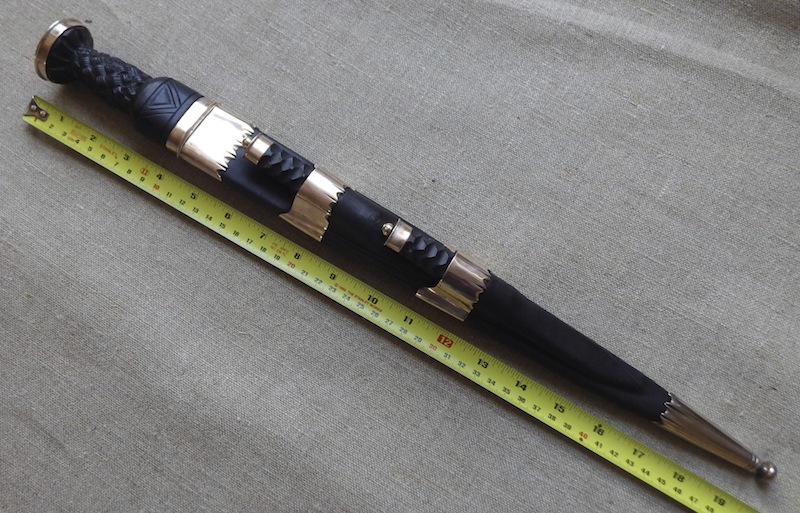 This is a mid 18thC reproduction of a Scottish Dirk. Dirks started to emerge as a cohesive design around 1630 and presumably followed on from bollock daggers and were generally wood, sometimes brass or horn or combinations of these and were comparatively plain. 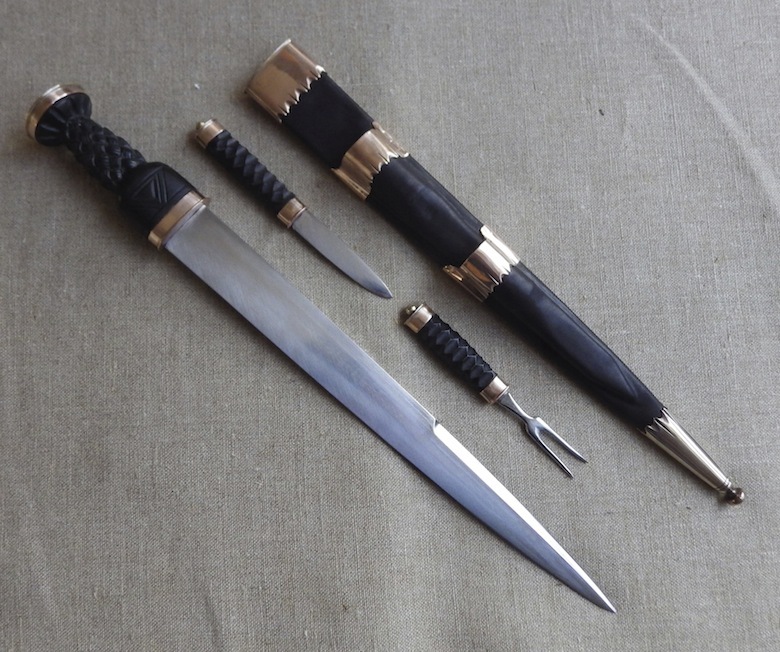 These were without a doubt formidable fighting knives. 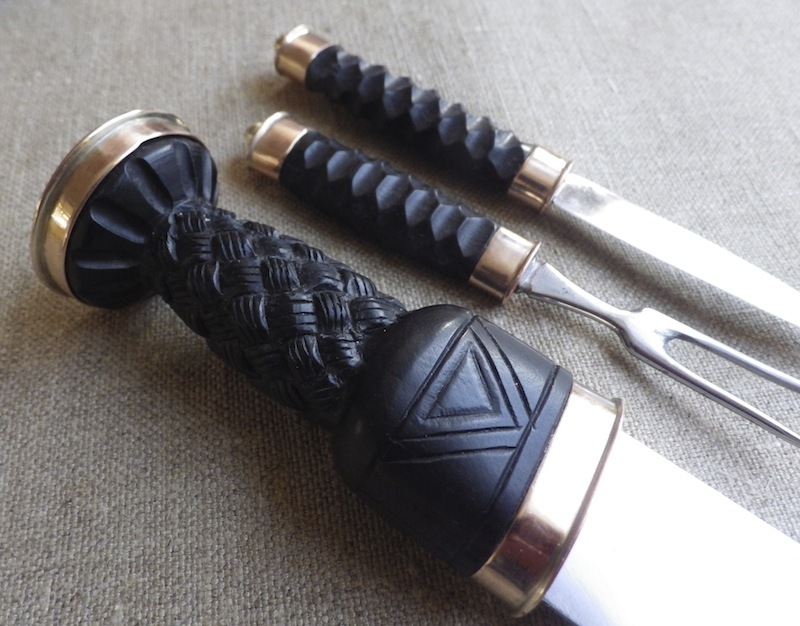 By around 1700 the knotwork style decoration for the grips had started to arrive and the handles start to get shorter and even more stylised in form, becoming an abstract of the more literal bollock dagger form of earlier years. Generally the intersections were decorated and tidied! by inserting brass studs. Byknives were unusual in the early years but by the early 18thC they became common, but the forks had two tines. These knives were still undoubtedly fighting knives. By the latter part of the 18thC these knives started to become a little more ceremonial in appearance and began to incorporate very fancy metalwork and large jewelled pommels etc and in my opinion start to look like tourist purchases. 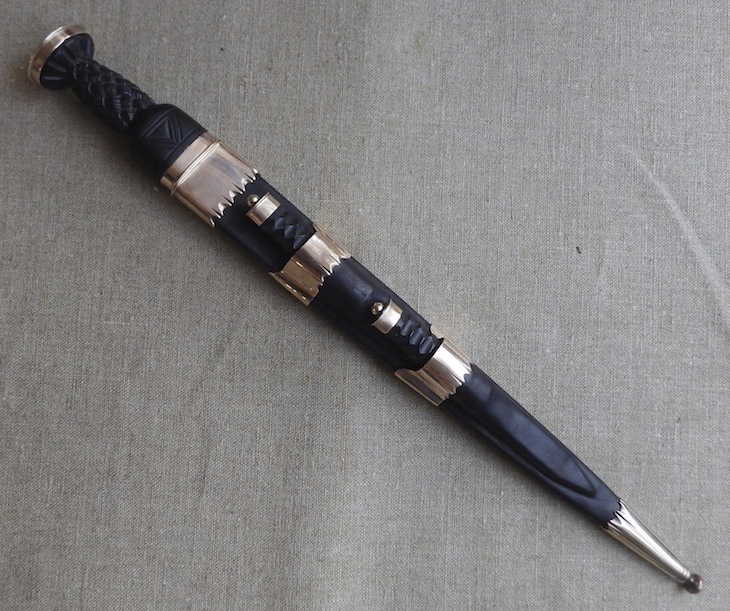 This reproduction has a carved ebony grip, the fittings are bronze and the 13"/330mm blade is a typical single sided with false edge style. 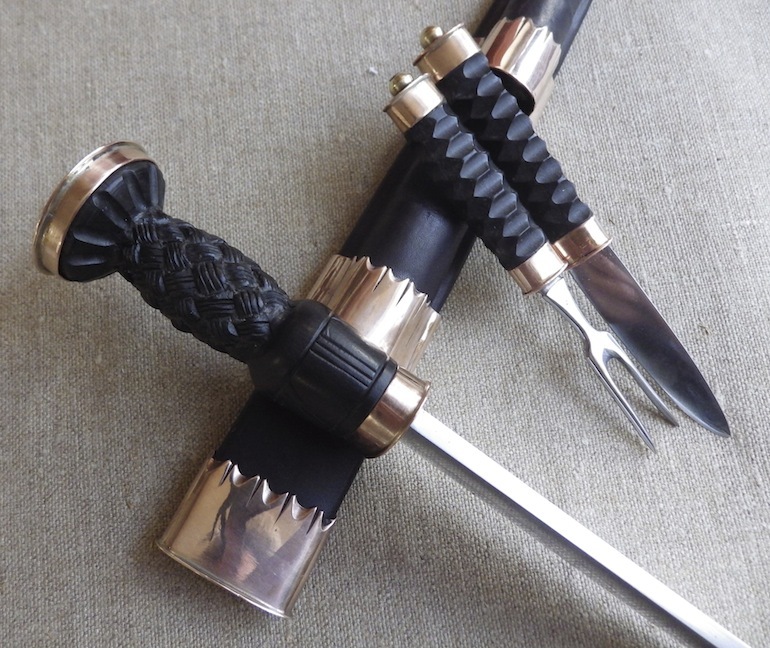 The dagger comes complete with byknife and two tine fork, which is again typical and all is housed in a vegtan scabbard with bronze fittings. What is notable in this reproduction and is the case for dirks of this period is the extremely short grip at a little under 2". No they did not have smaller hands! 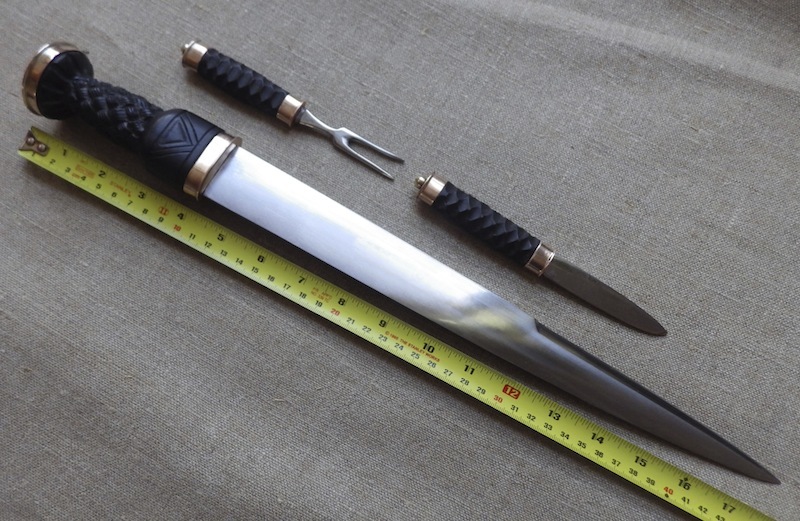 The grip extends from the cone to over the swelling near the blade and so to modern eyes this would be unacceptable in a knife design and yet to them it was desired. It is indeed a feature of many medieval knives that the handles appear tiny by our thinking and yet again and again the hand uses part of the guard or the pommel as a gripped area. Anyway thanks for reading my ramblings and I hope you like it. Beautiful yet purposeful, I like it a lot! Hmmm, that looks familiar . Nice to see some background on the design choices. Looking forward to adding it to my collection! Really dig the 'french-fry' grips. Look good, and I'd imagine they feel good too!